Have you lost track of developments in generative linguistics, finding yourself unsure about the distinctive features of minimalism? Would you like to know more about recent advances in the genetics of language, or about right hemisphere linguistic operation? 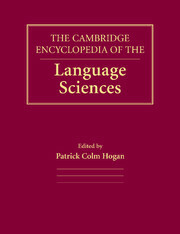 The Cambridge Encyclopedia of the Language Sciences addresses these issues, along with hundreds of others. It includes basic entries for those unfamiliar with a given topic and more specific entries for those seeking more specialized knowledge. It incorporates both well-established findings and cutting-edge research and classical approaches and new theoretical innovations. The volume is aimed at readers who have an interest in some aspect of language science but wish to learn more about the broad range of ideas, findings, practices, and prospects that constitute this rapidly expanding field, a field arguably at the center of current research on the human mind and human society. Part I. Introductory Essays: 1. Language structure in its human context: new directions for the language sciences in the twenty-first century William Croft; 2. The psychology of linguistic form Lee Osterhout, Richard A. Wright and Mark D. Allen; 3. The structure of meaning James Pustejovsky; 4. Social practices of speech and writing Florian Coulmas; 5. Explaining language: neuroscience, genetics and evolution Lyle Jenkins; 6. Acquisition of language Barbara Lust; 7. Elaborating speech and writing: verbal art Patrick Colm Hogan; Part II. Entries.